There are a few different ways to set up tracking for your boost. You may set up Tracking Variables in Boost Settings, use Custom Variables in Boost Settings, or include your tracking in the Destination URL when uploading your content under the Manage Content tab. To avoid discrepancies, we recommend you set up tracking using only ONE method. Please note when adding tracking codes, anything inserted at the content level will override the tracking on the boost level. When adding tracking in your boost settings, it will automatically append to each piece of content within the boost. To set up Tracking Variables or use Custom Variables, select the gear icon to the right of Tracking in Boost Settings. Identifies the source of your clicks. The source needs to be the same across ALL your boosts to passback correctly. Identifies clicks by each piece of content within your boost. Identifies your campaign. This should be easy to identify the specific boost in your tracking. It is important to note that GA is case sensitive and cannot recognize misspellings or non-html encoded custom values. For this reason, it is imperative that utm_source is consistent among all campaigns. Using Revcontent, revcontent, RevContent, etc. will cause tracking discrepancies between the two platforms. If you would like to use your own Custom Variables, you may add them at the bottom of the Tracking Setup window in Boost Settings. 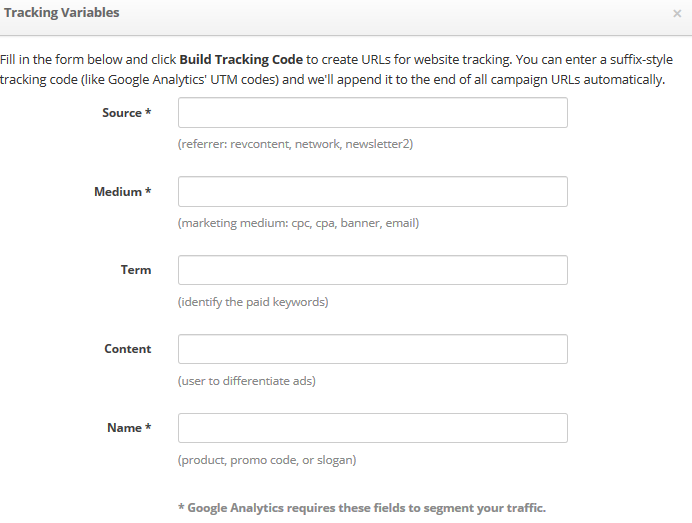 Be sure to select "Build Tracking Code" to save your tracking. For more detailed information on passing back information using Google Analytics, click here. For more detailed information on passing back information using Voluum, click here.